Medical website templates with patient-centric design. No matter whether the user is in an emergency situation or casually browsing your website, these sensibly designed website templates will give a better user experience. 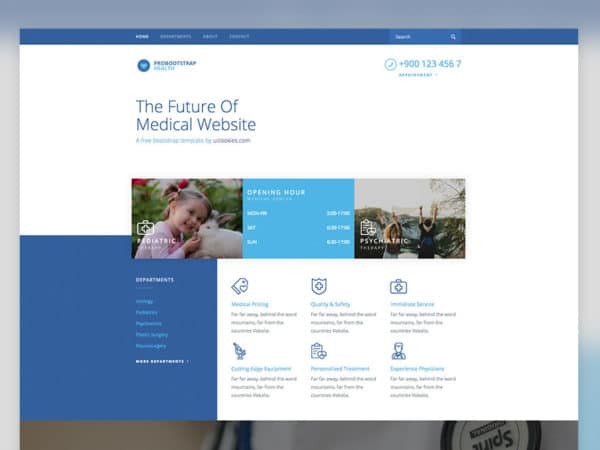 As most medical websites are accessed via hand-held devices during emergency situations, all our medical website templates are made mobile responsive. Mobile responsive designs of the medical website templates are done precisely so that important contents like emergency numbers and online reservation are shown clearly on mobile devices as well. To manage patients effectively, today’s hospitals use hospital management systems and AI-powered chat supports. All the basic inquiries like available doctors, confirming an appointment with doctors can be done via chat support itself. Our website templates are made flexible enough for future updates so that you can add any modern tools to it as your demand grows.